Edelbrock Victor series water pumps provide maximum cooling for street and competition. They are ideal to prevent overheating in street rods, kits and street machines. Using state-of-the-art racing technology, Edelbrock has designed these “super cooling” water pumps to provide maximum flow, pressure and equal distribution to both sides of the block within 1%. These high performance pumps flow in one direction only for optimum efficiency. The casting’s computer-designed internal passages and CNC-machined cast iron impeller produce the maximum flow rate possible. 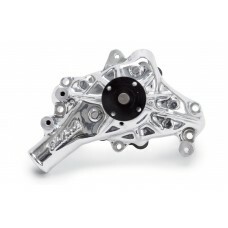 Features include heavy-duty 3/4-inch bearings and billet steel hubs. They also look great! This pump is the same as EDEL8811 but has the Endurashine finish. Long style pump with 5/8” pilot shaft for 1967-87 and later cars and trucks. Engines requiring maximum front of engine clearance can use short style pump EDEL8811. Does not fit Corvettes or late-model vehicles with serpentine accessory drive belts. Dimension from back of pump (block face) to pulley hub 6-15/16”. Inlet size 1.80”. Use pulleys MRG4974 & MRG4976 (Chrome) or MRG5314 & MRG5316 (Aluminium).